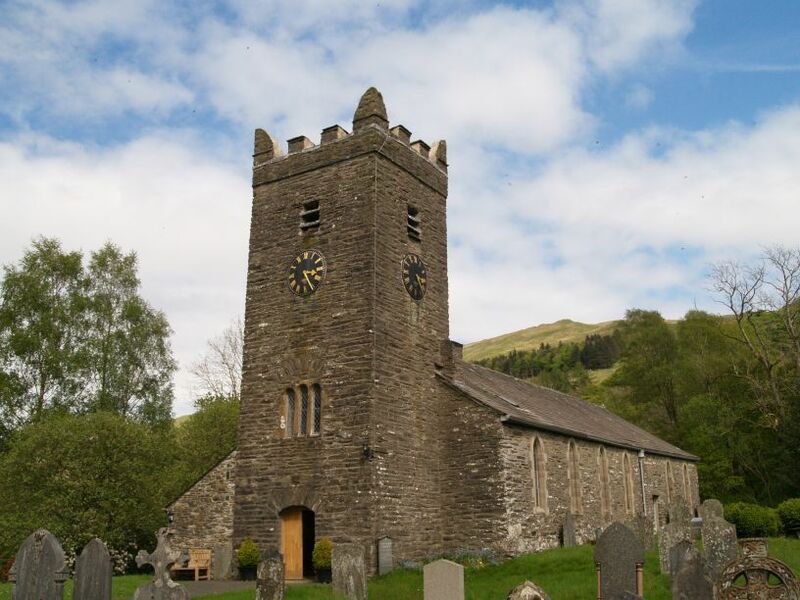 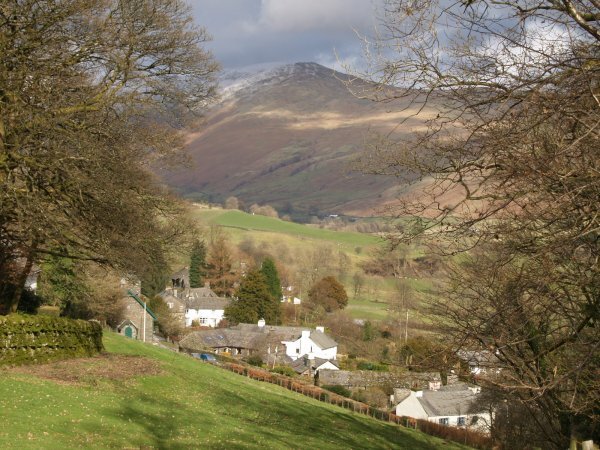 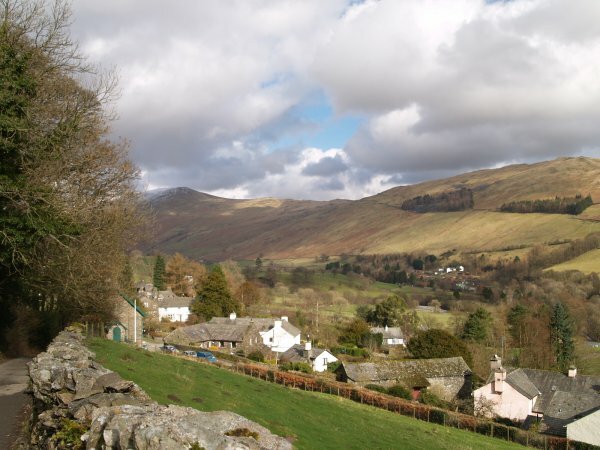 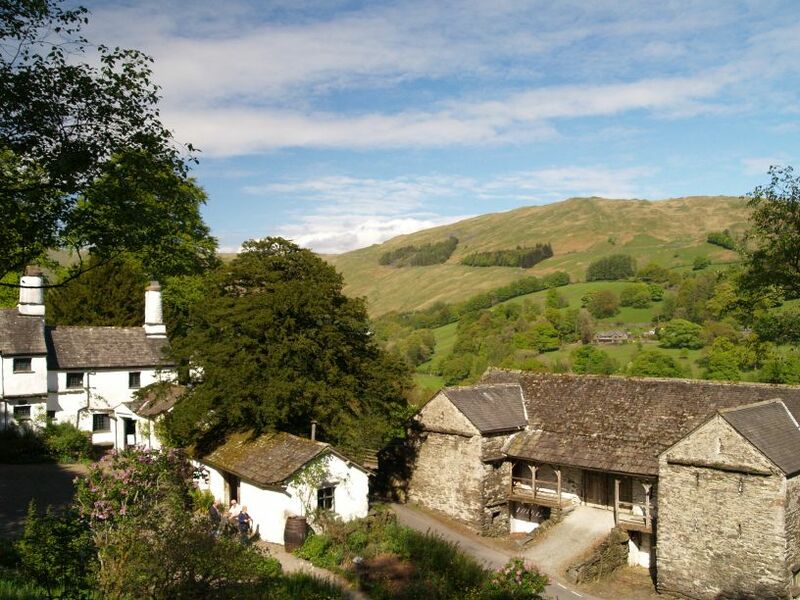 The upper part of Troutbeck village, Town Head and High Green, a very atmospheric setting! 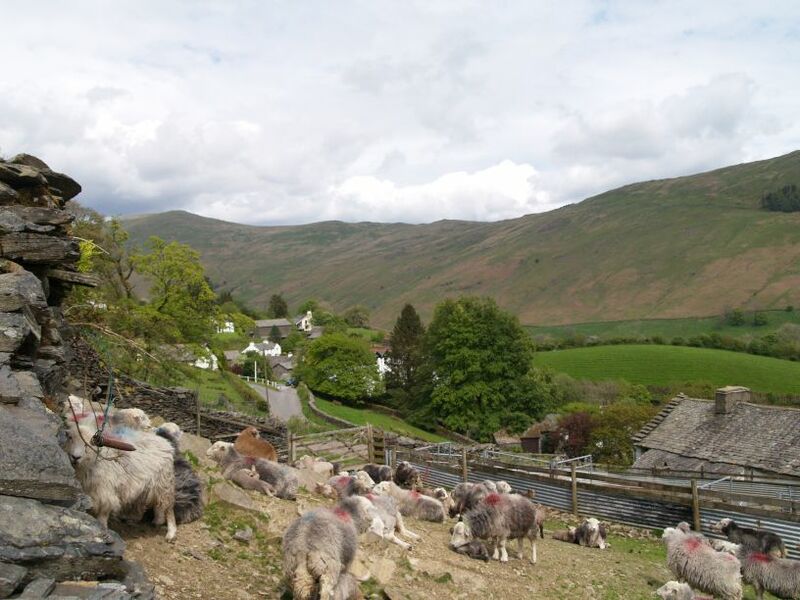 Sheep on the farm in the centre of Troutbeck Village. 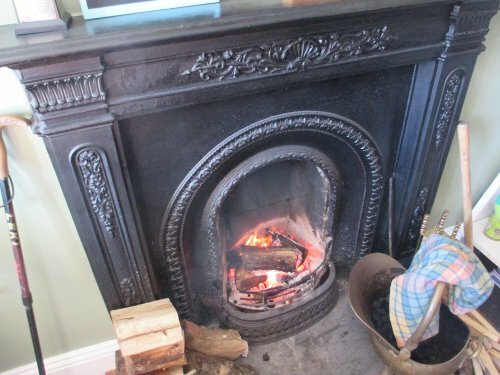 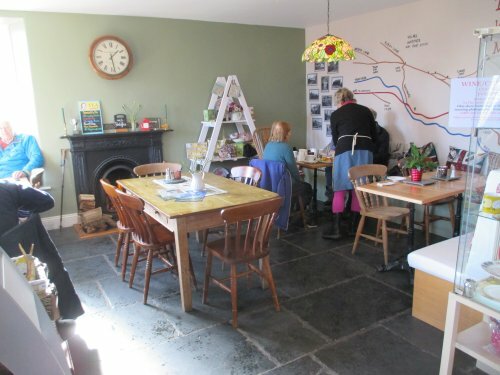 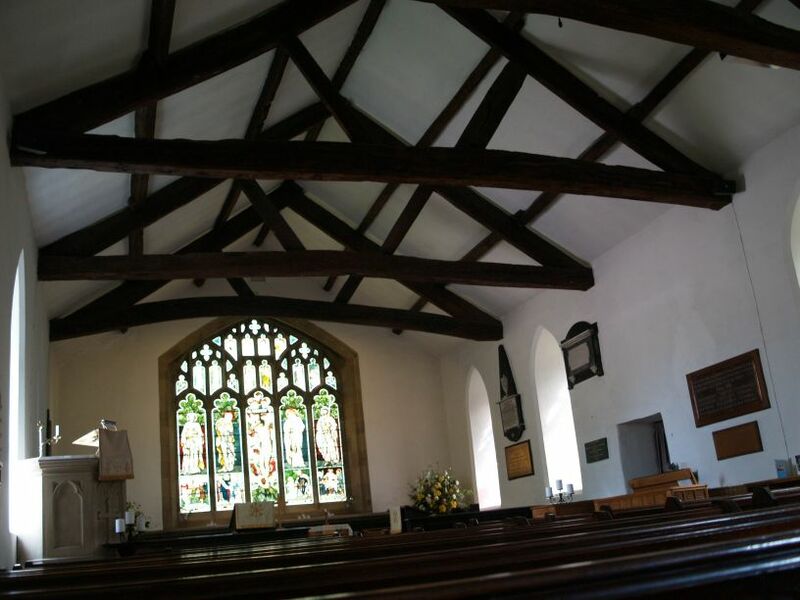 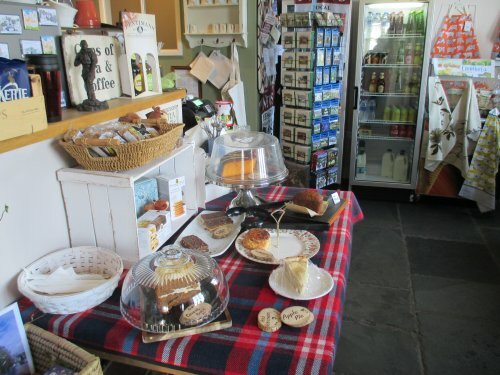 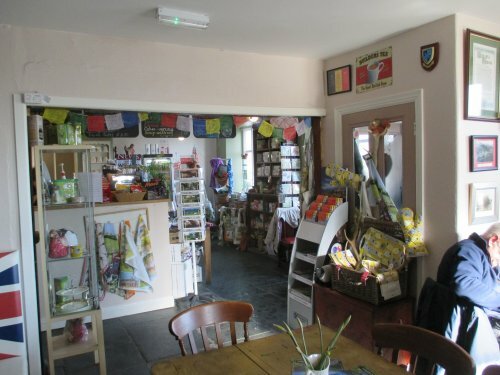 The Old Post Office Cafe Tearoom - a good friendly place for a snack and drink and a warm fire in winter! 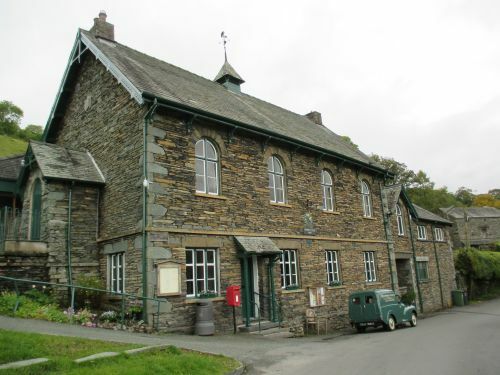 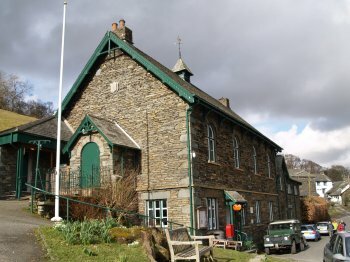 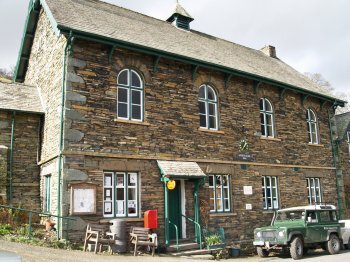 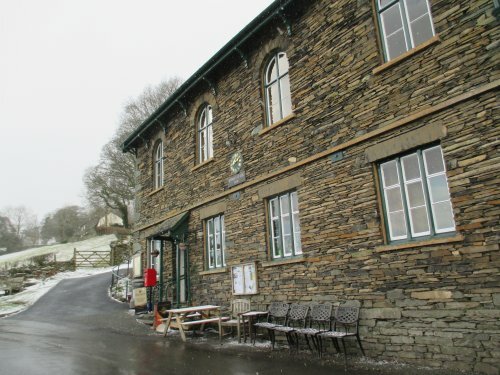 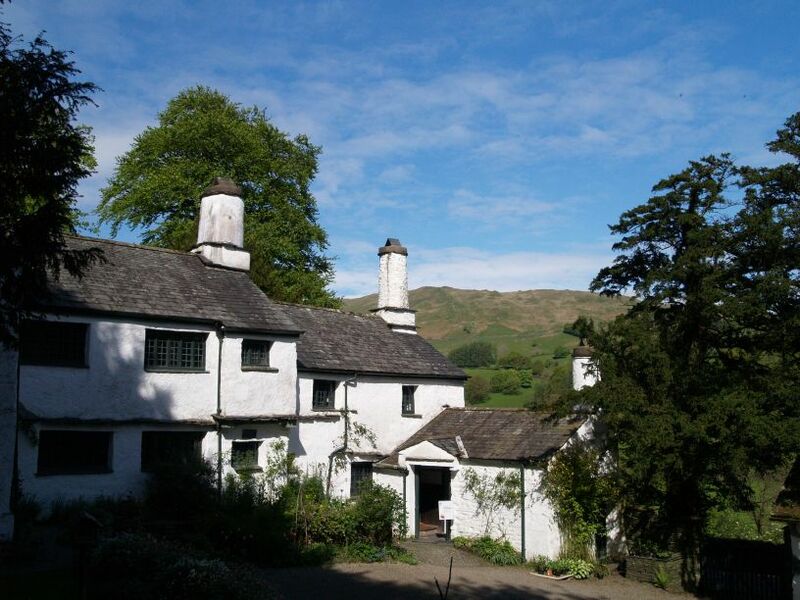 Walking down from High Fold to Low Fold you reach the building of the 'Troutbeck Institute', dated 1869, also houses the Post Office from which you can also purchase a tea or coffee and other refreshments! 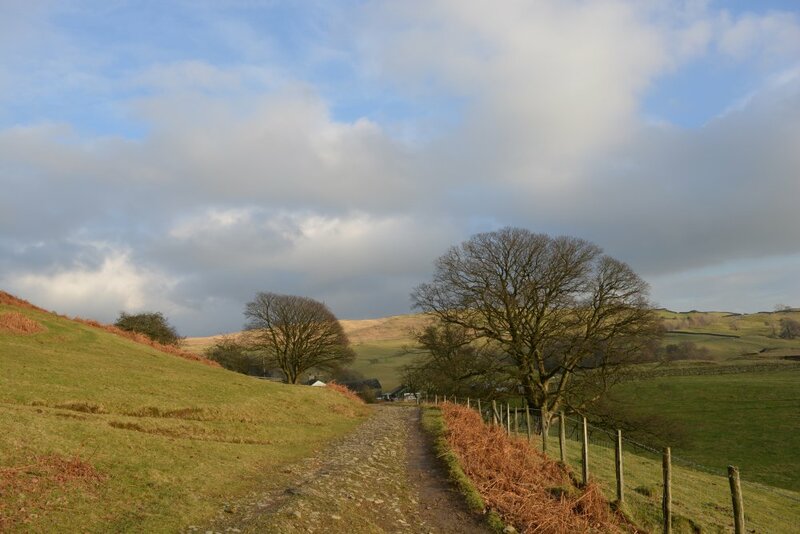 You then head south-west up Robin Lane, initially a minor road but changes to a double-walled track higher up. 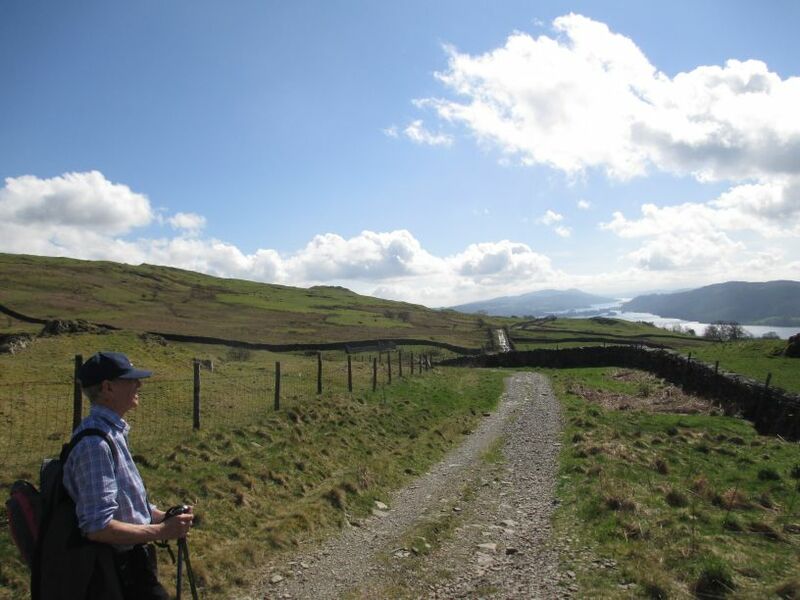 The views continue to be superb on this most beautiful of walks and the weather was most kind to us. 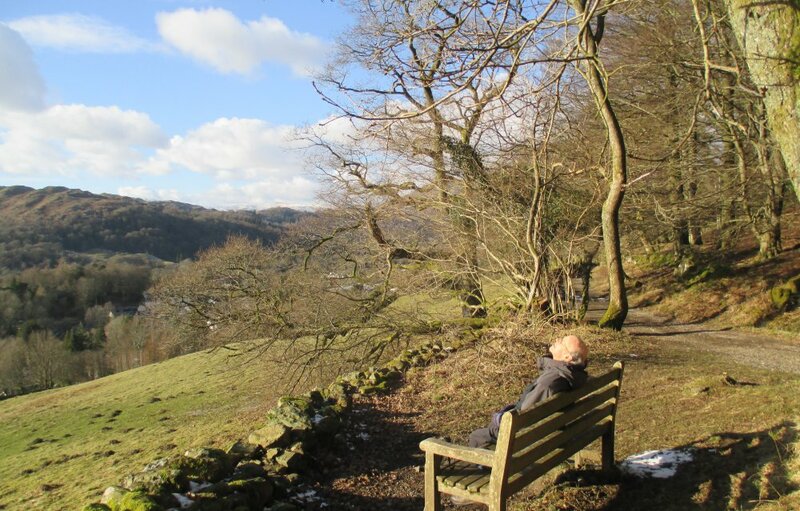 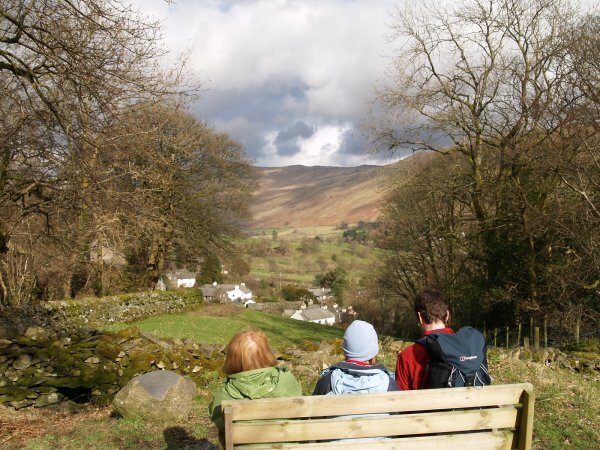 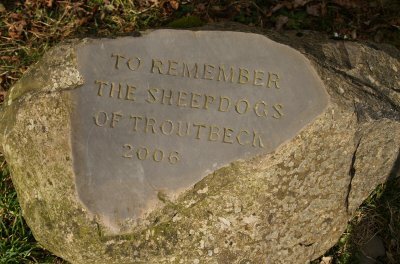 There is a bench half-way up and an excellent picnic spot by a stone inscribed 'TO REMEMBER THE SHEEPDOGS OF TROUTBECK 2006'. 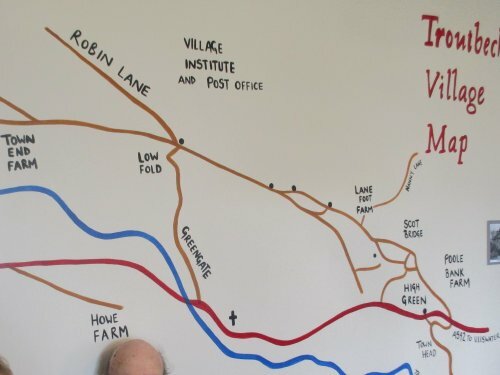 Robin Lane is now a track. 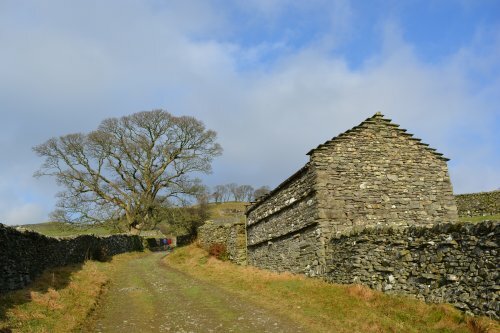 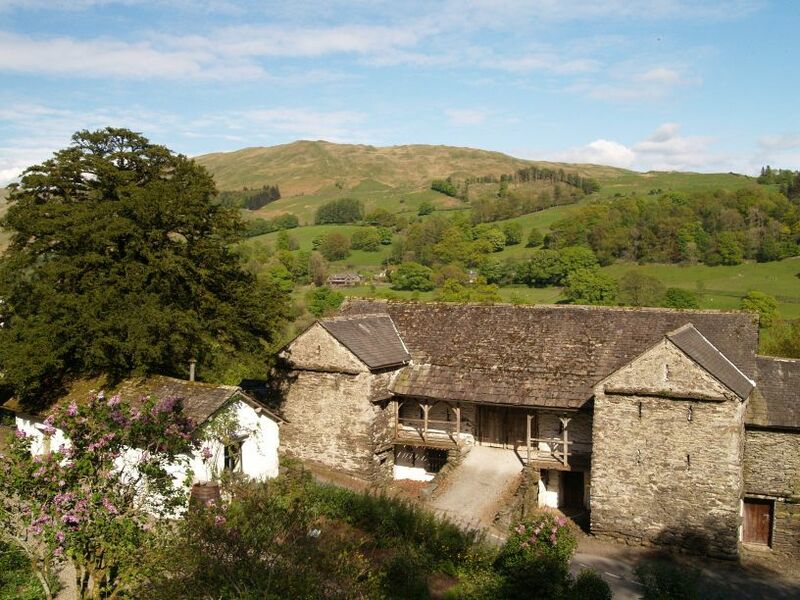 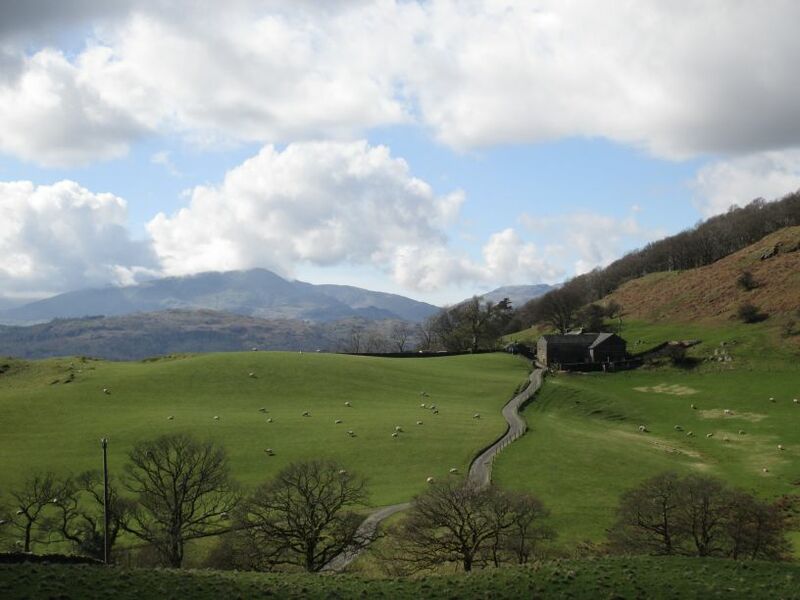 An old barn, in good condition, above Troutbeck village. 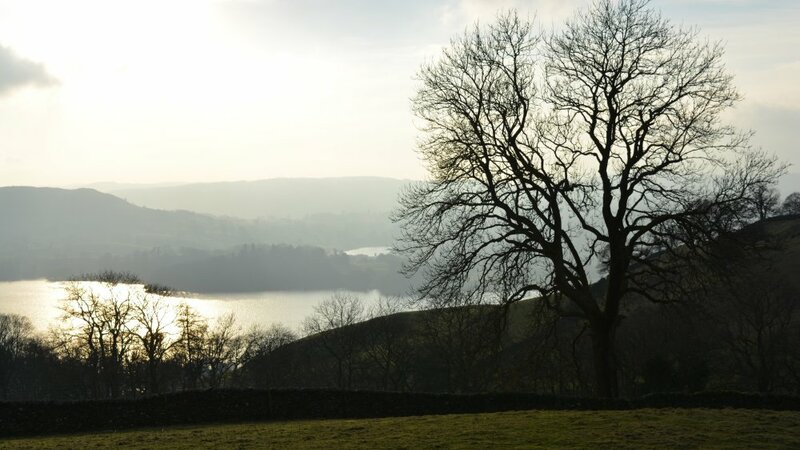 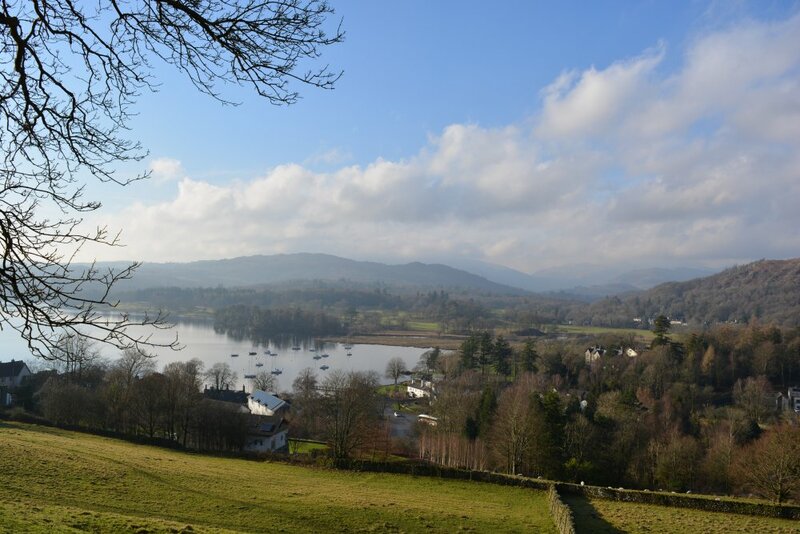 Looking south-west from Robin Lane over Lake Windermere. 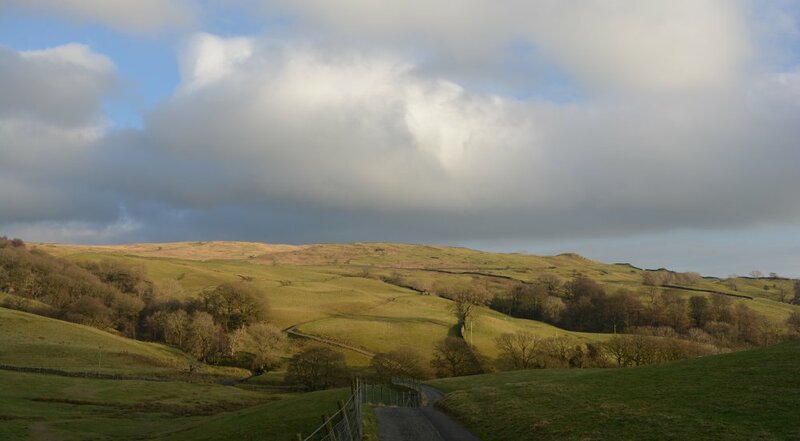 Looking south-east to the distant low hills. 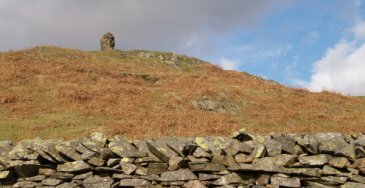 There are several 'pillars' marked on the OS map of the area - purpose/function? 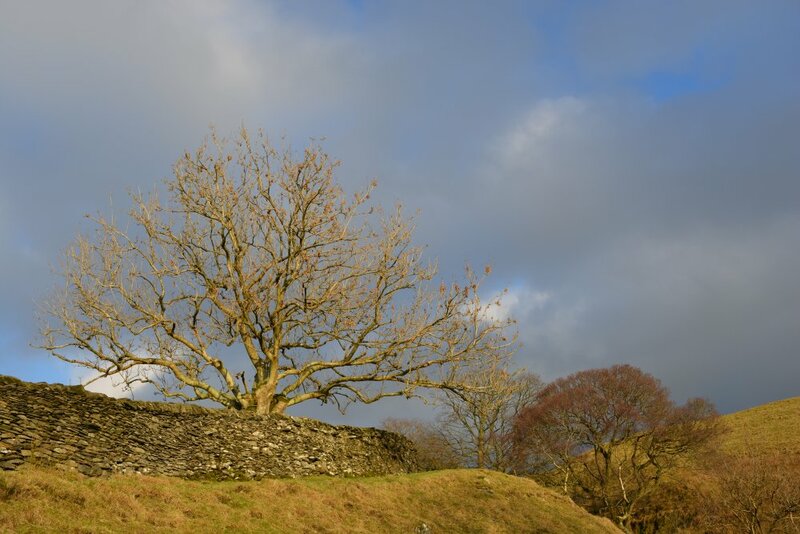 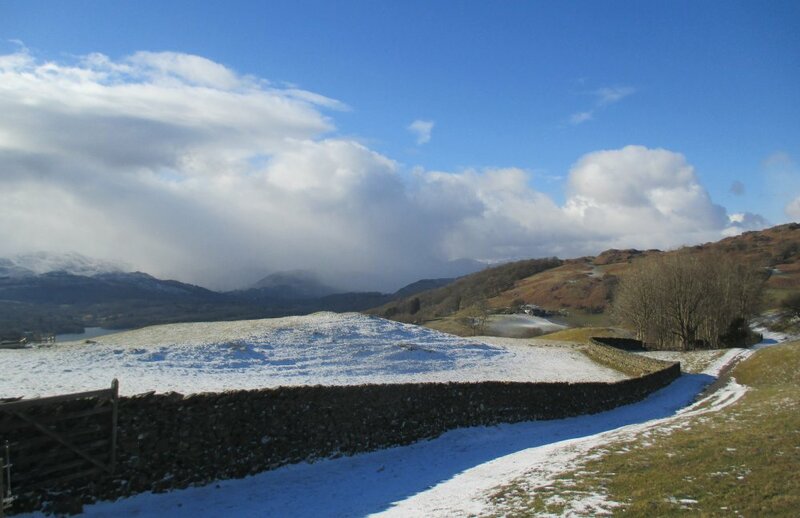 Sky, dry stone walls and clouds - stunning winter atmosphere! 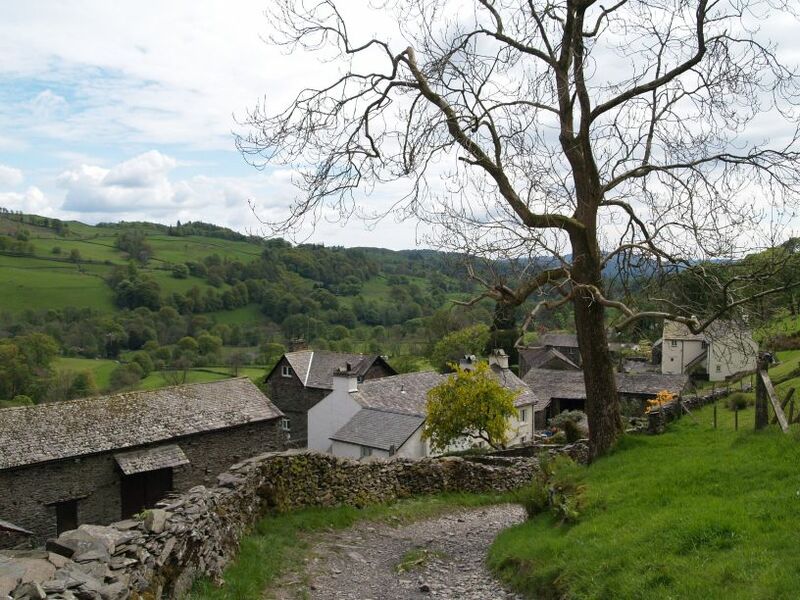 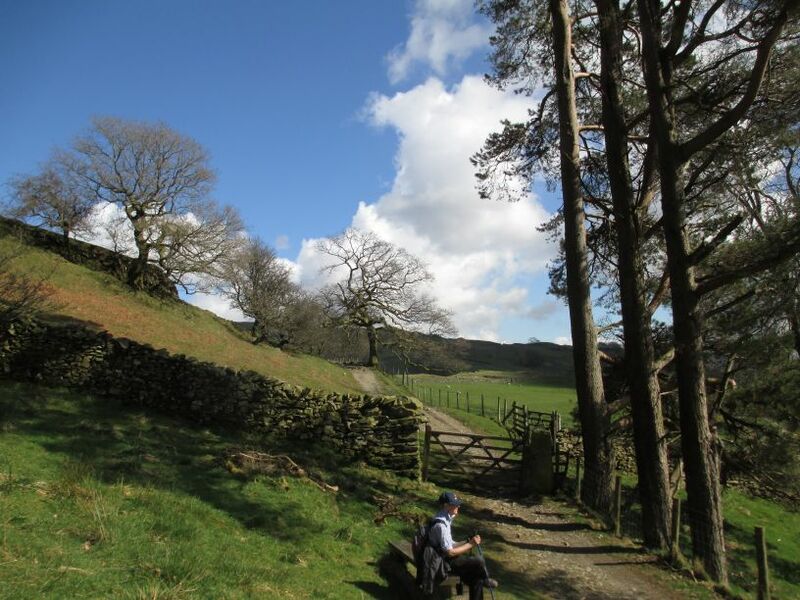 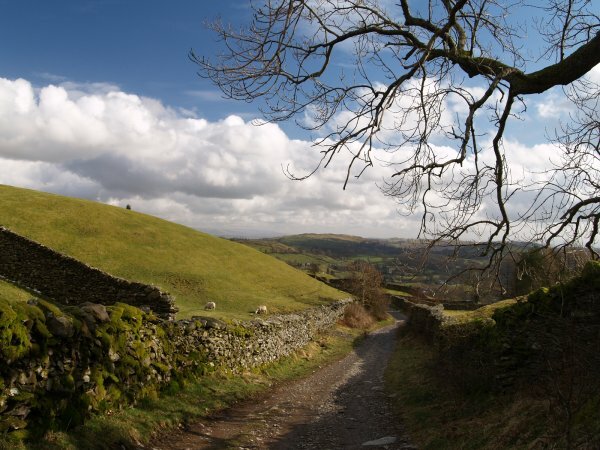 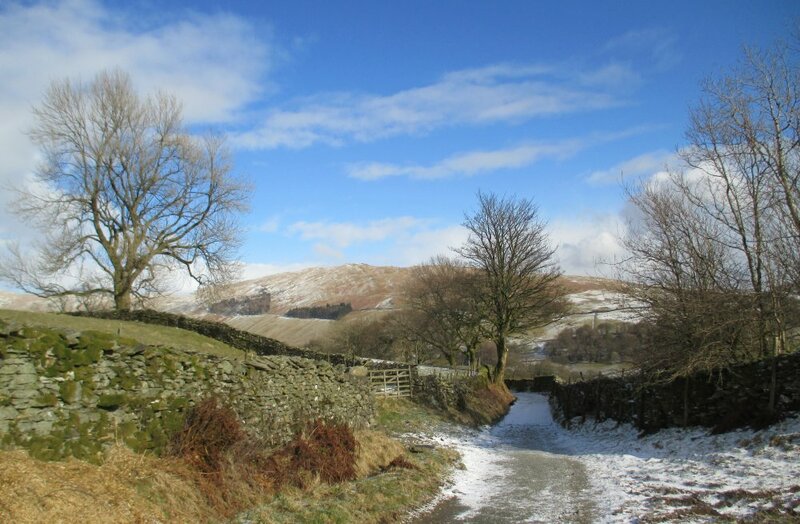 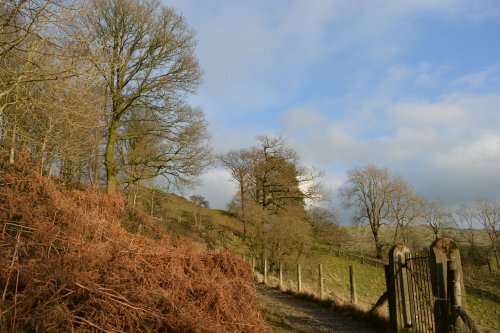 Looking back down Robin Lane towards Troutbeck. 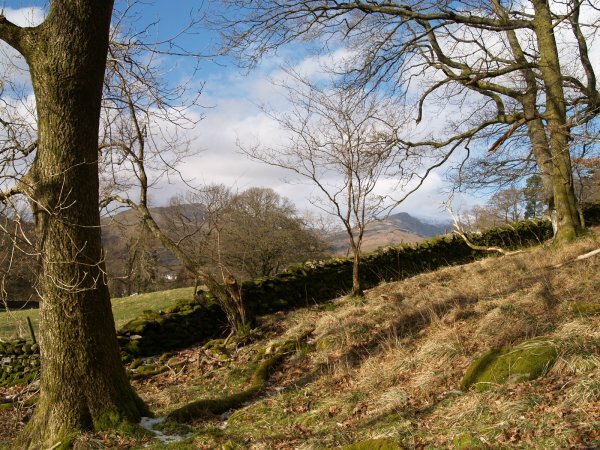 A fine dry stone wall perched on the top of a linear rocky outcrop. 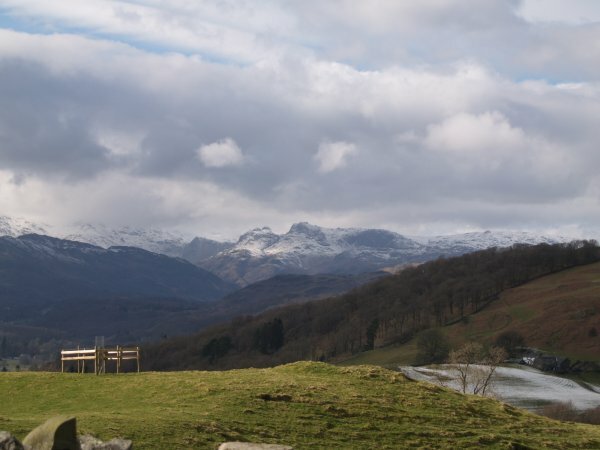 The Langdale Pikes come into view again and the weather has cleared up a bit over there - very overcast when we started the walk. 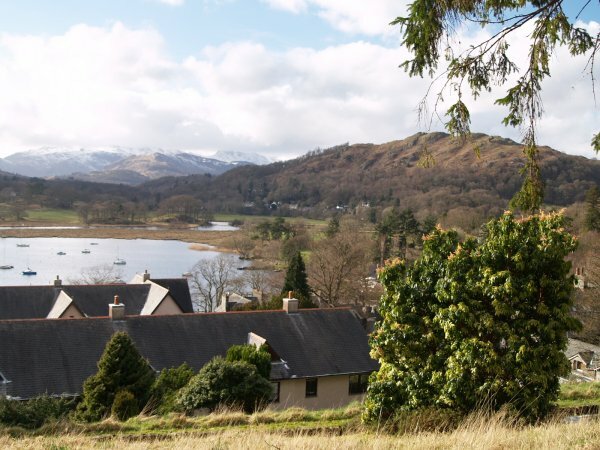 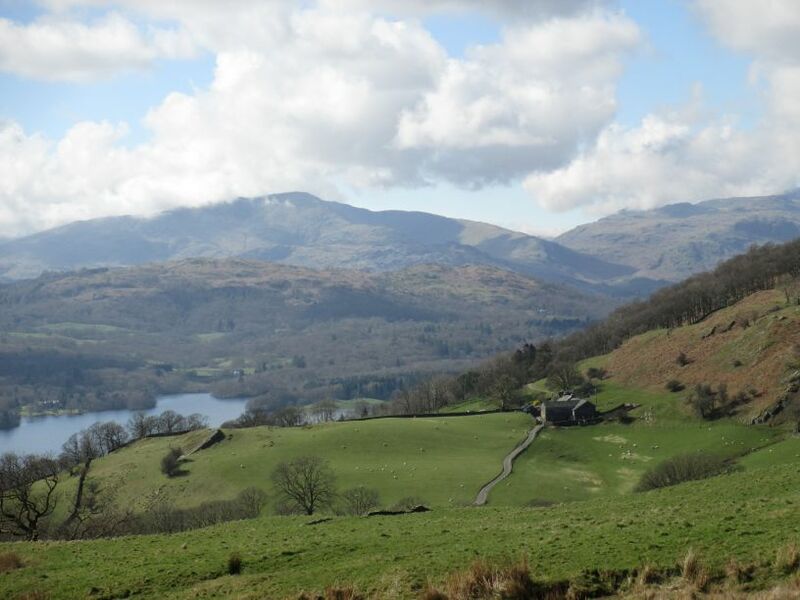 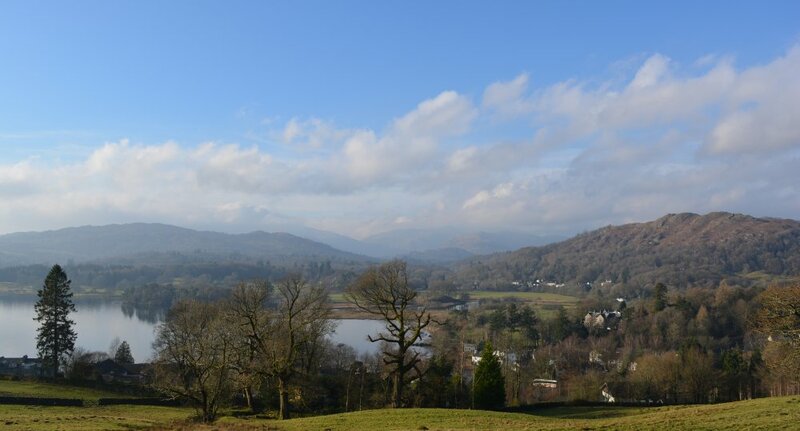 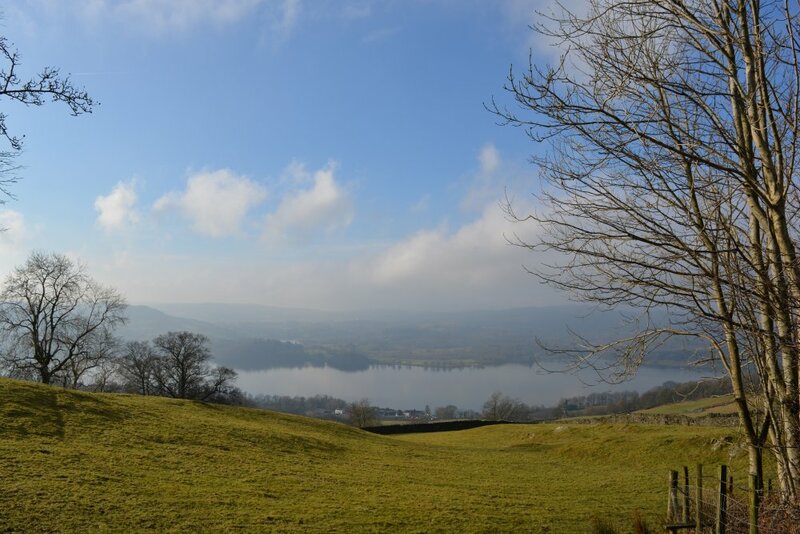 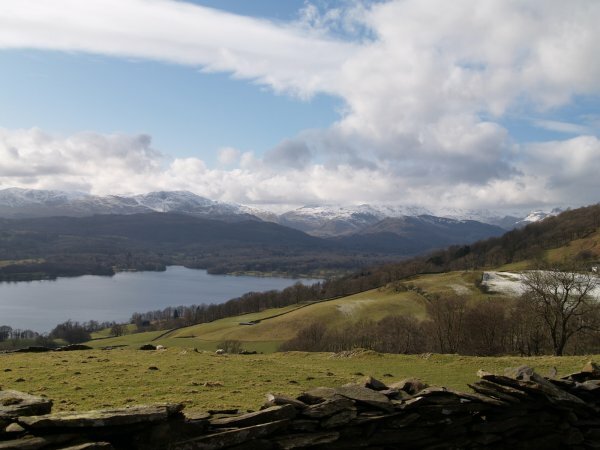 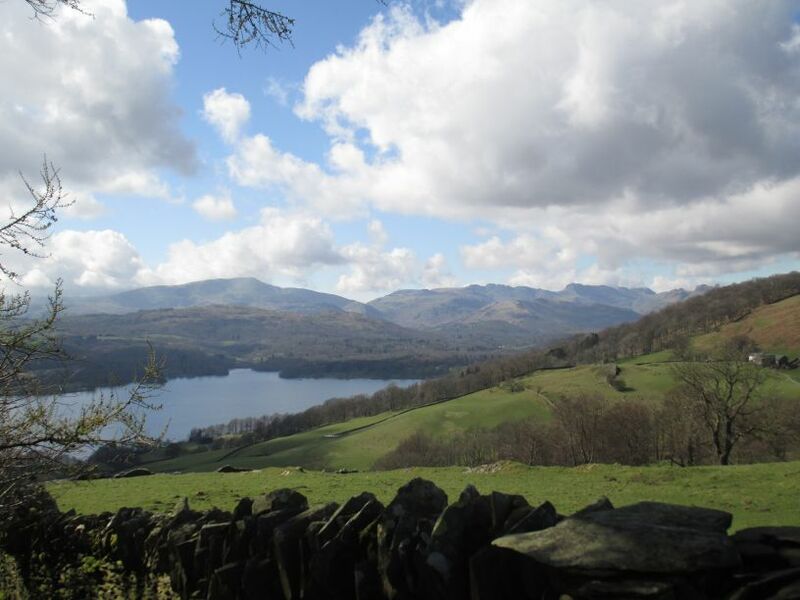 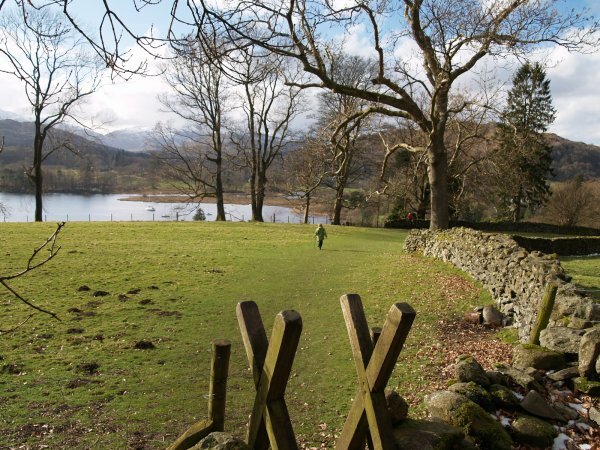 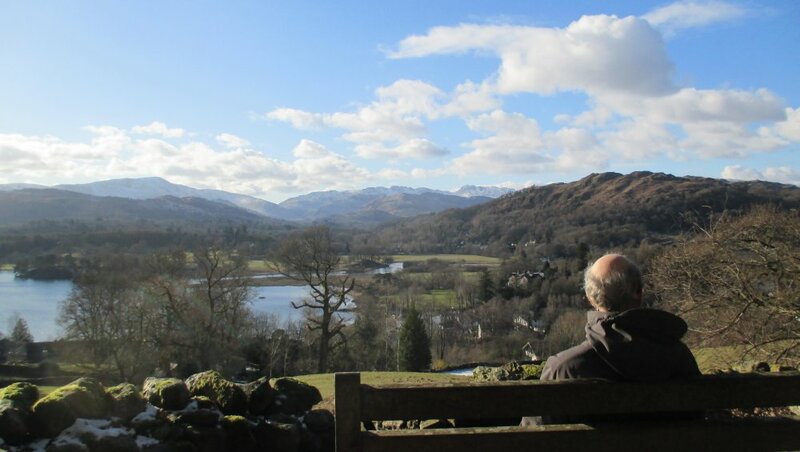 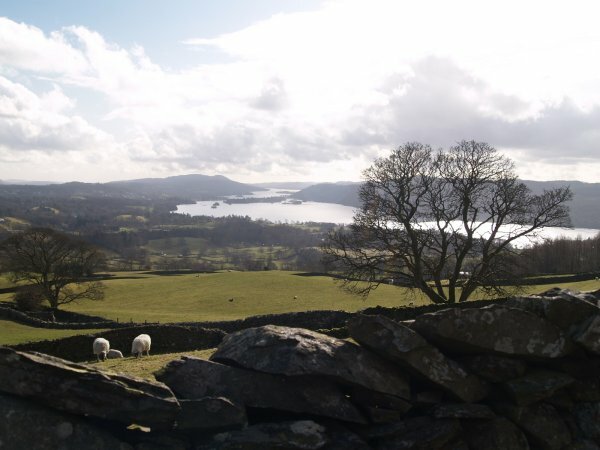 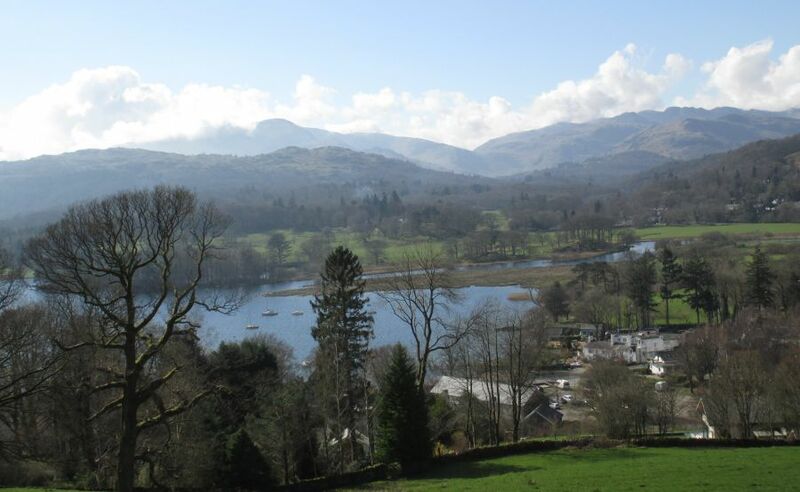 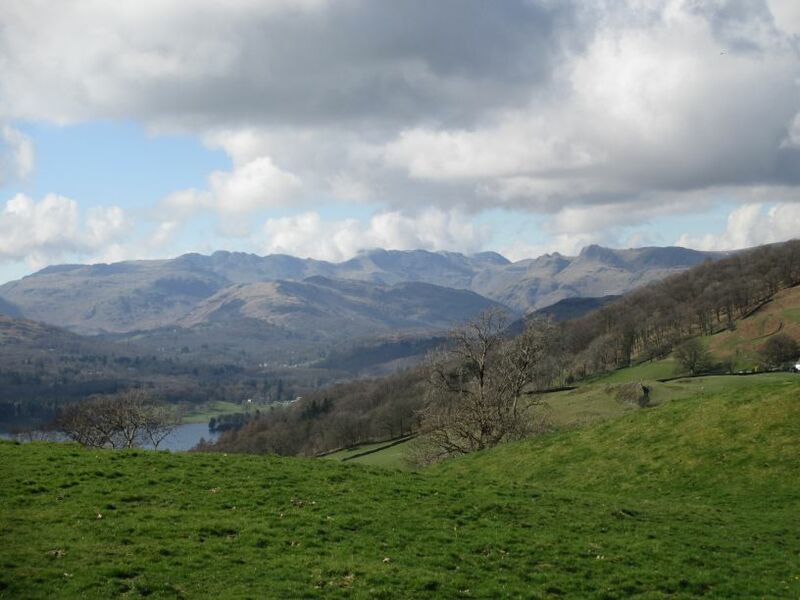 The northern part of Lake Windermere also comes into view. 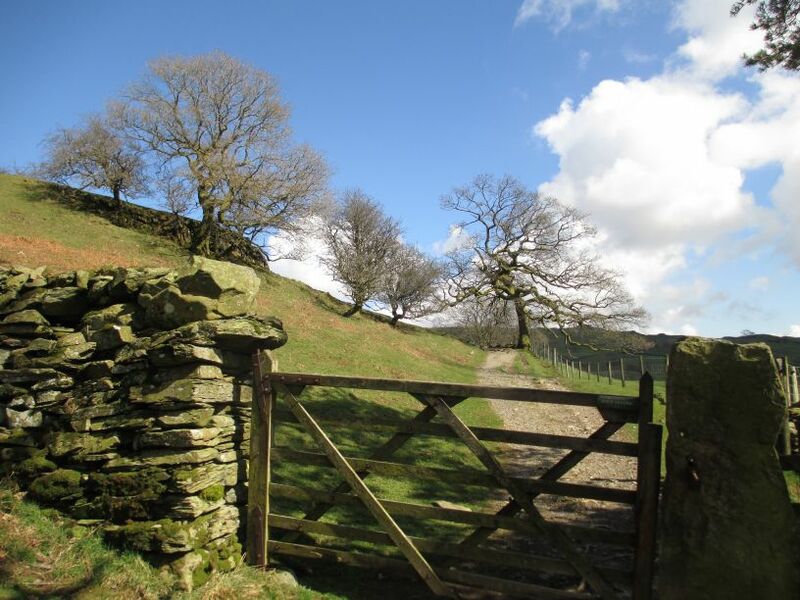 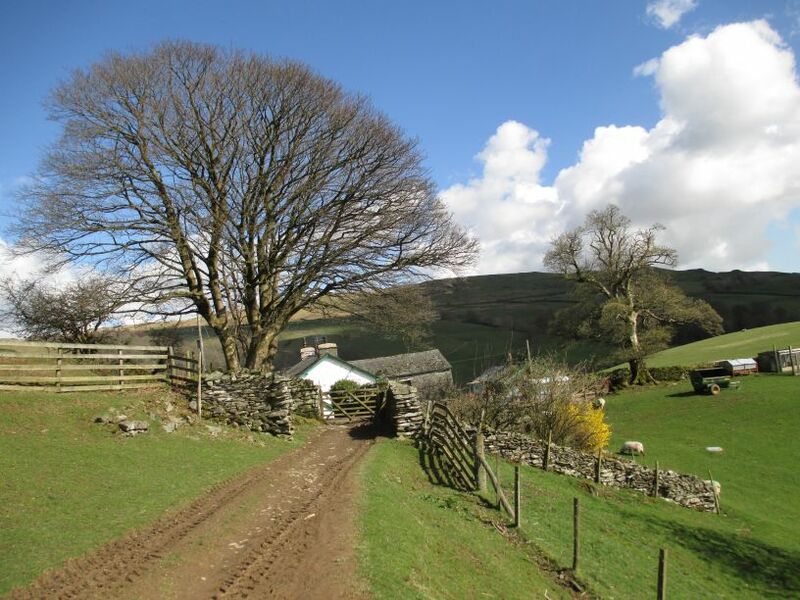 You pass through the yard of High Skelghyll Farm. 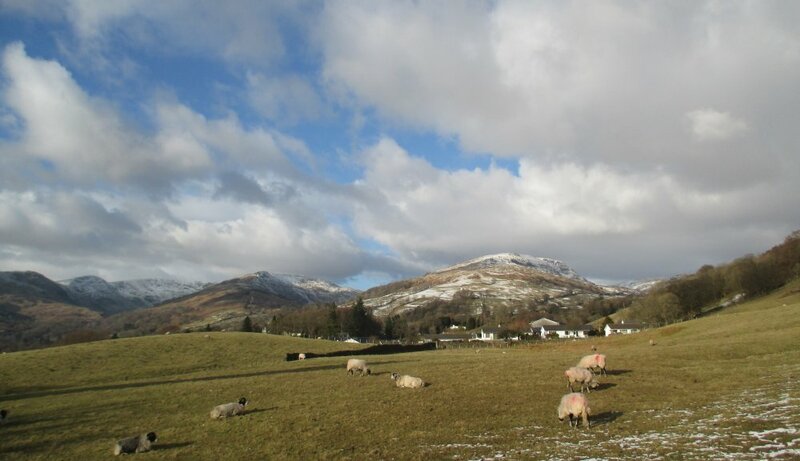 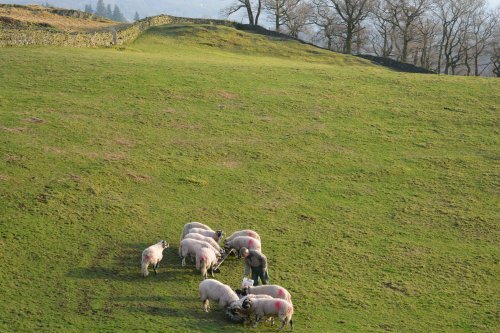 Lovely winter colours for us, but the sheep on High Skelghyll Farm must be fed! 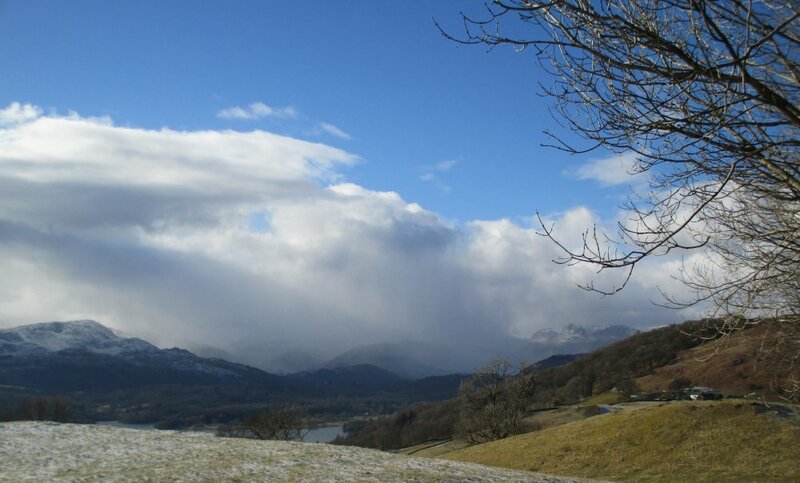 Windermere has its own winter has attractiveness! 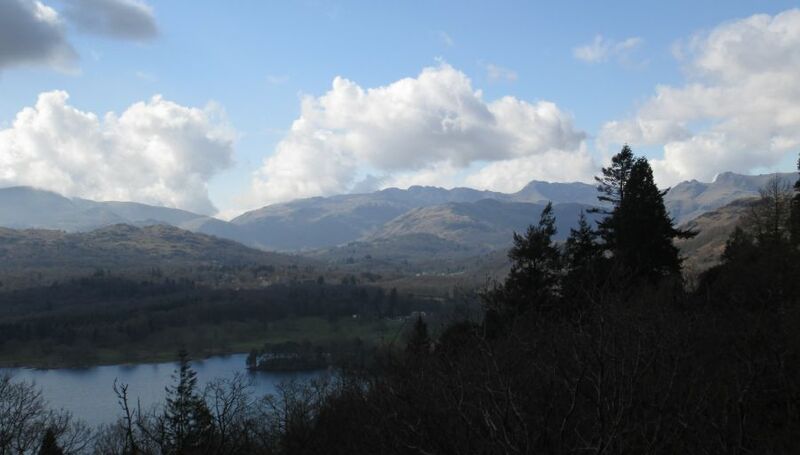 Heading down to Ambleside and the head of Lake Windermere via Skelghyll Woods. 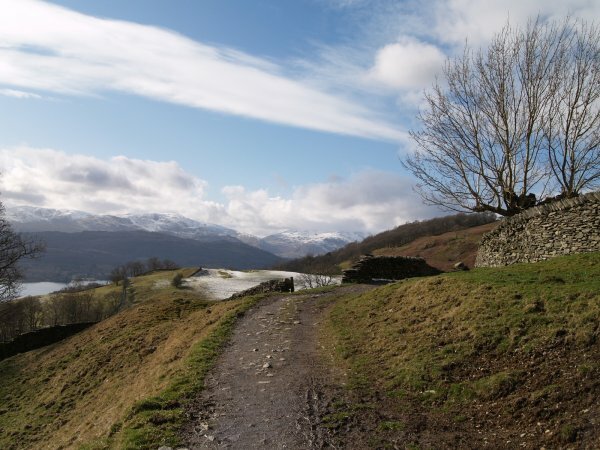 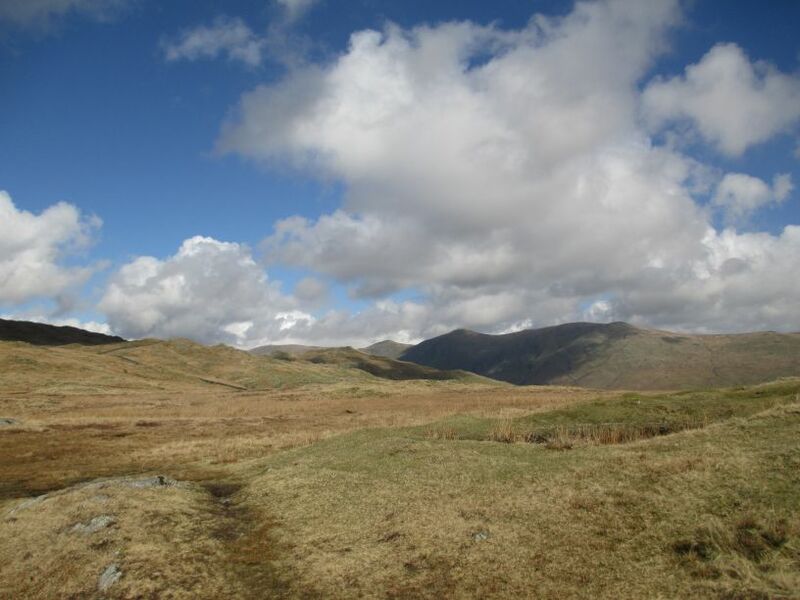 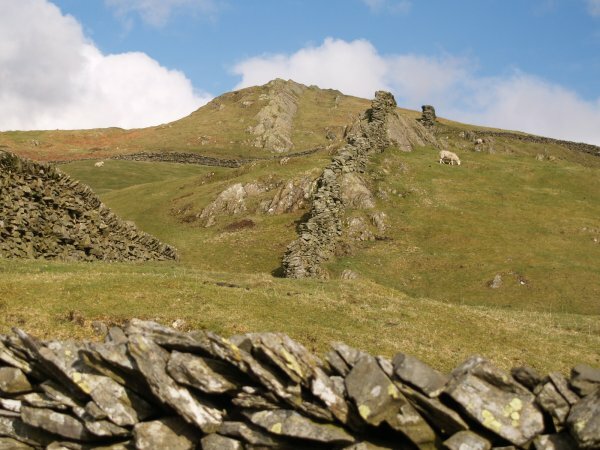 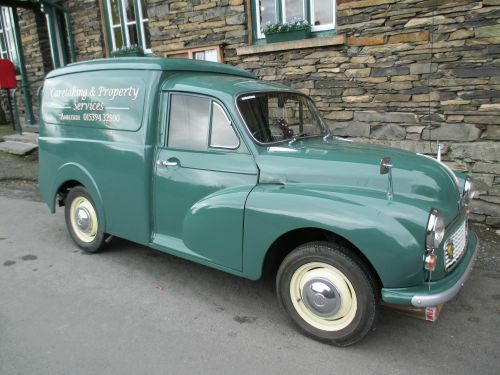 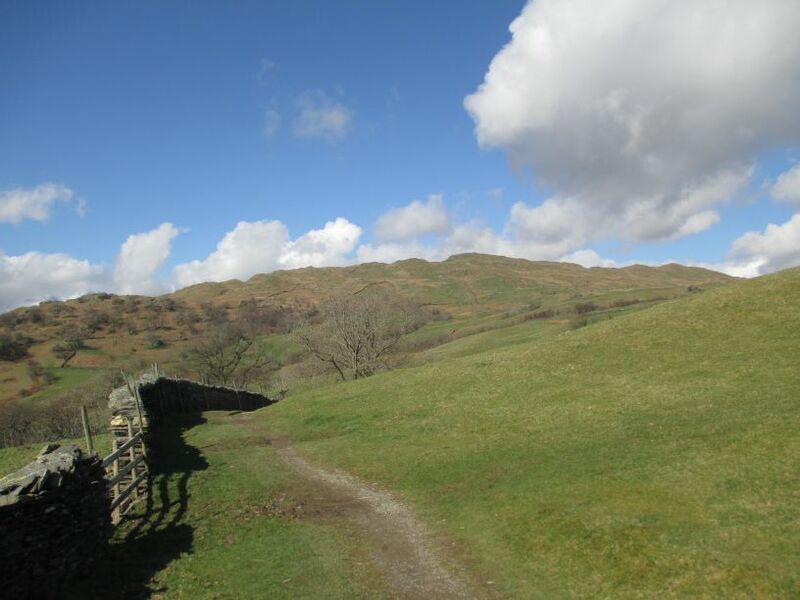 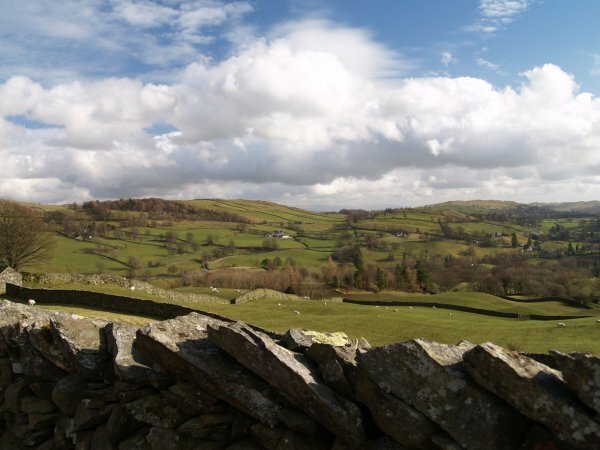 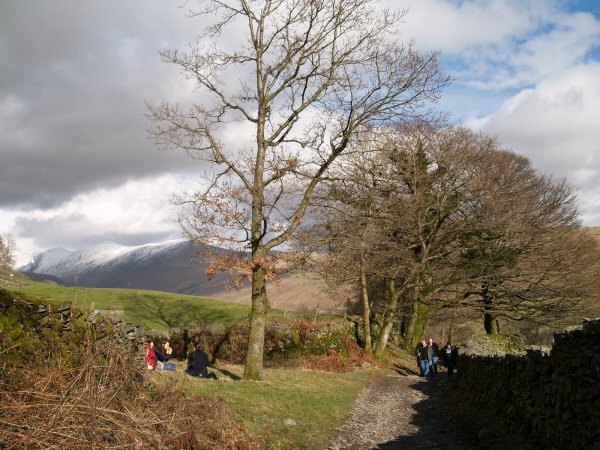 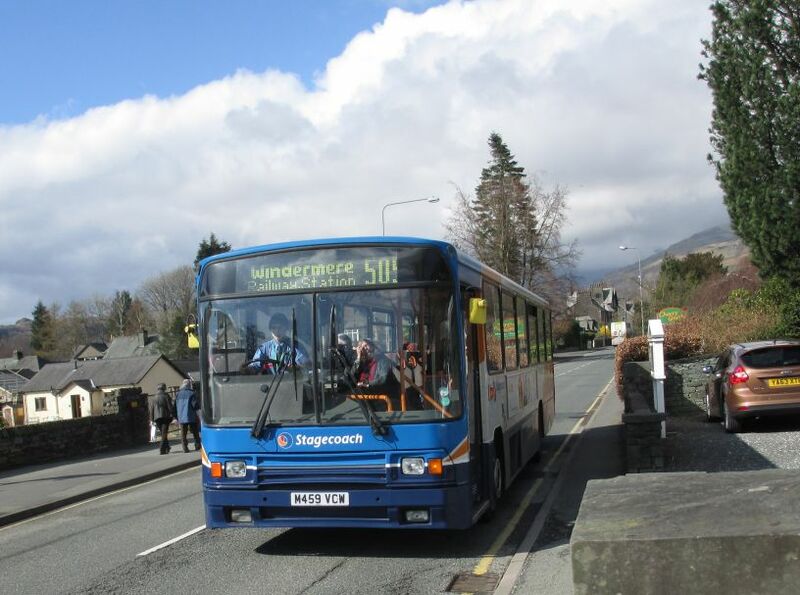 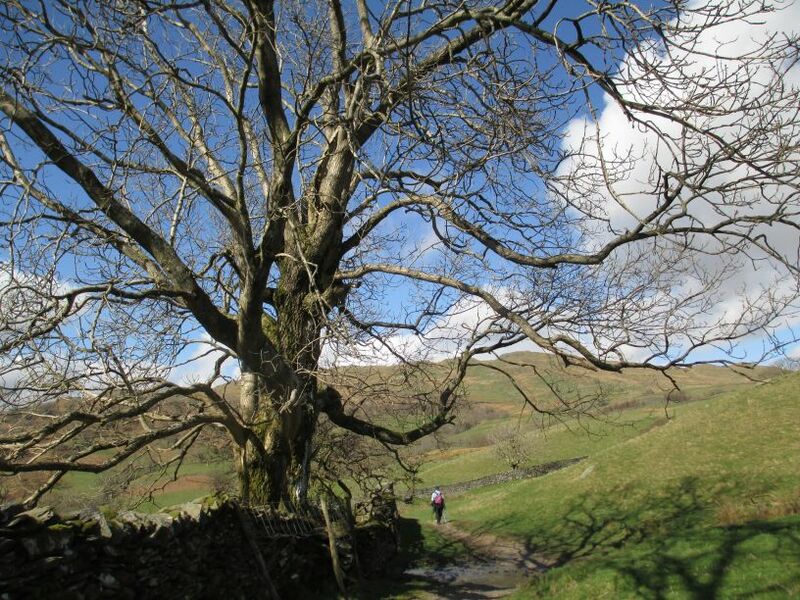 A digression - there is a route down from Wansfell Pike that misses out Troutbeck. 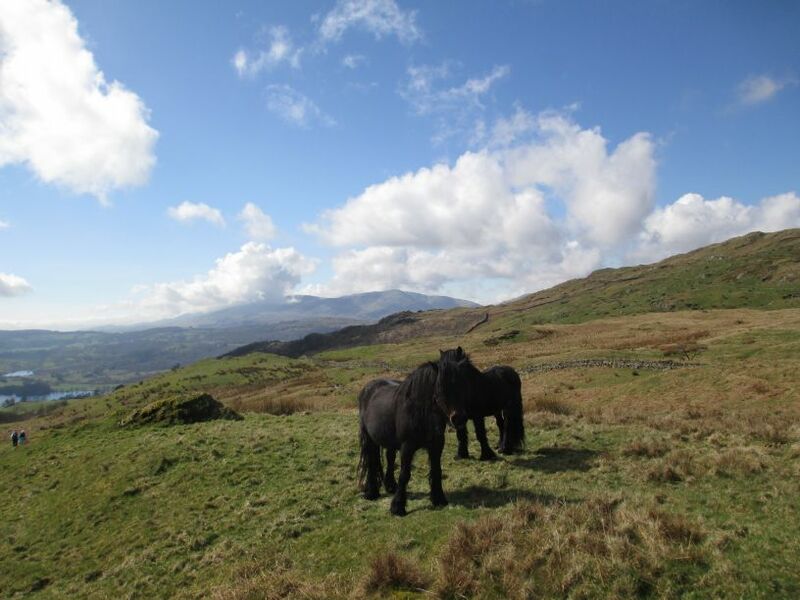 ... semi-feral horses, a tough breed! 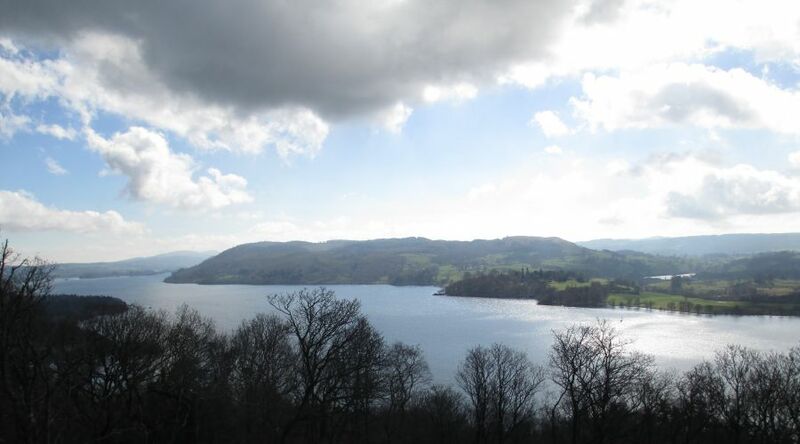 ... with Lake Windermere below. 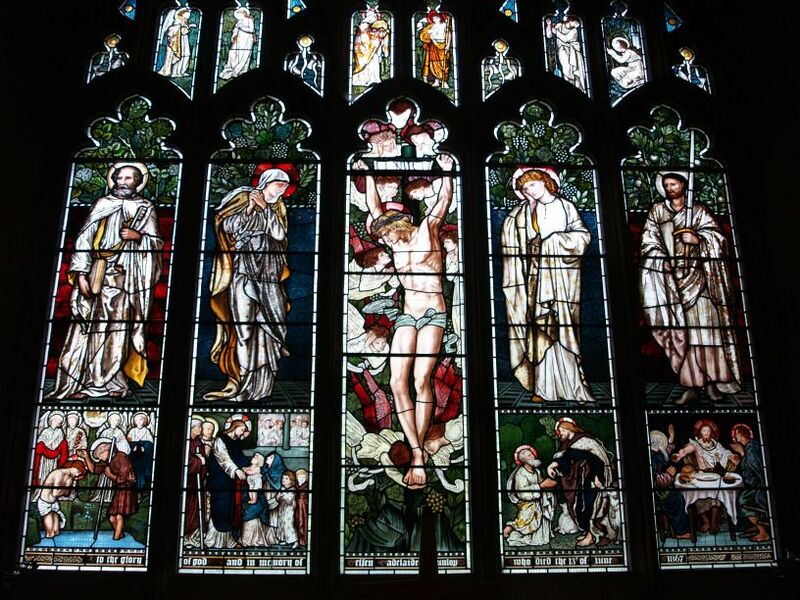 The east window - stained glass from Morris & Co. in 1873 (by Burne-Jones, Morris & F. M. Brown), it depicts the Annunciation, Baptism, Crucifixion and ?. 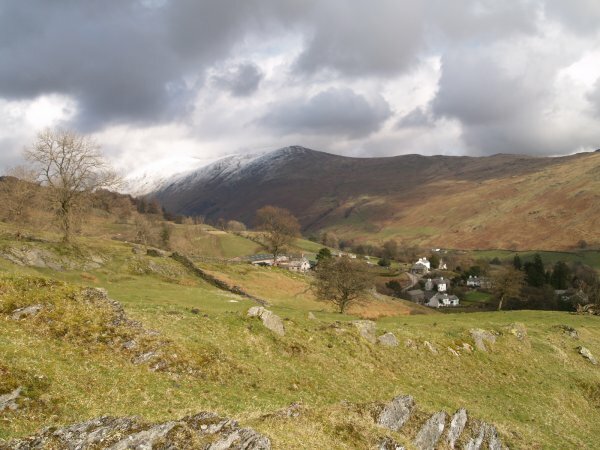 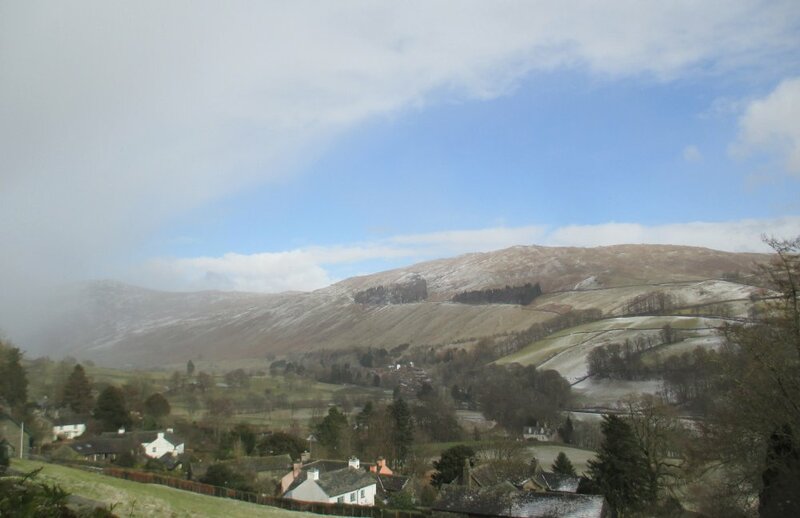 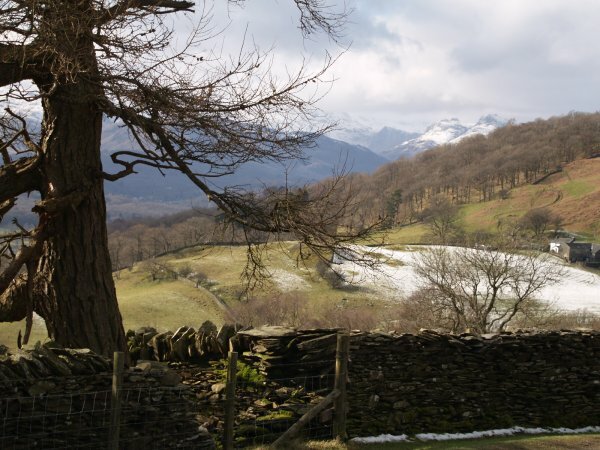 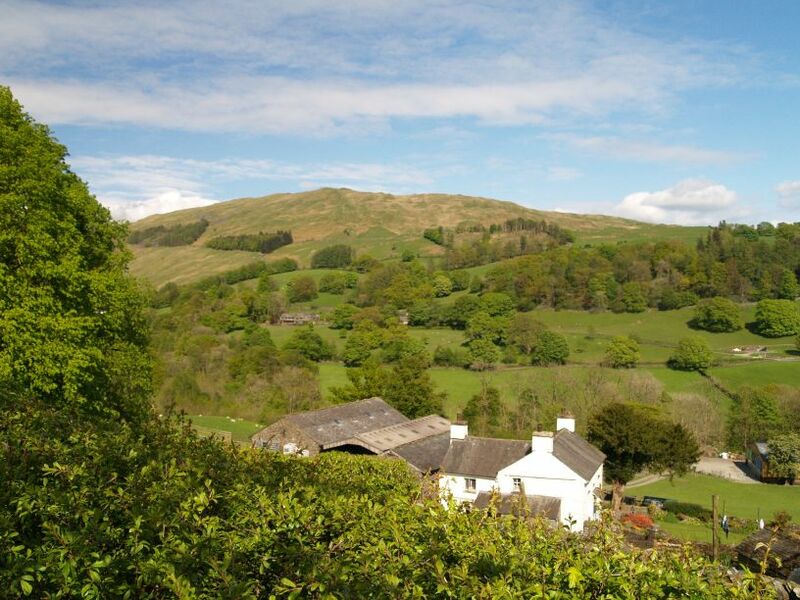 The valley south of Troutbeck where the National Trust managed 'Town End' house is. 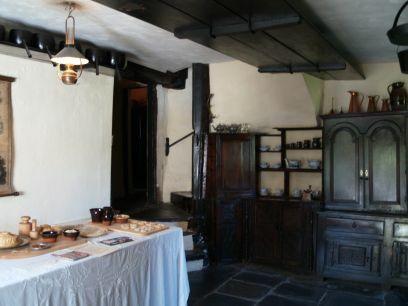 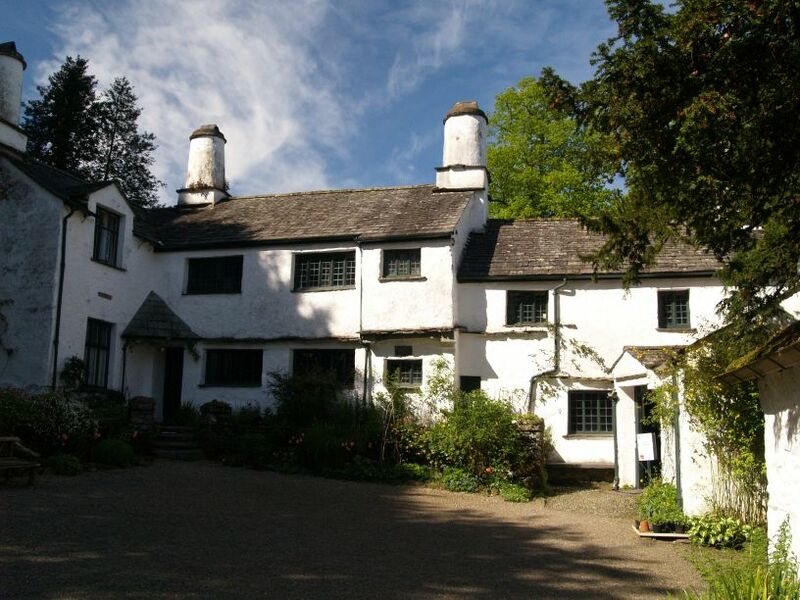 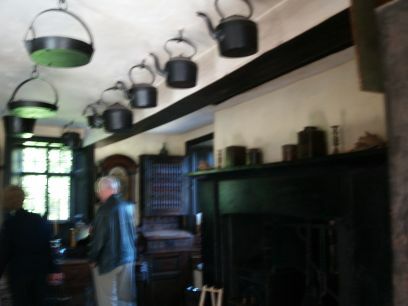 Town End house has mullioned windows and typical chimneys from ~1626. 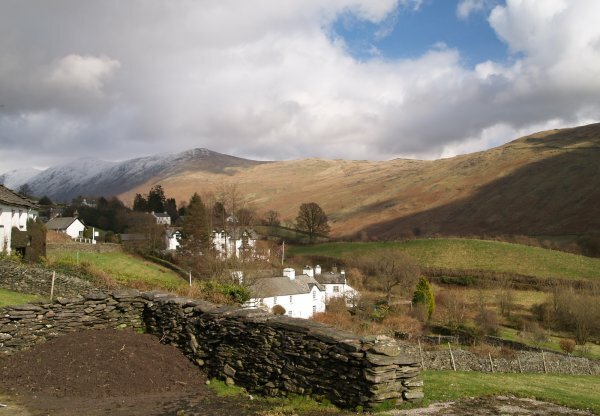 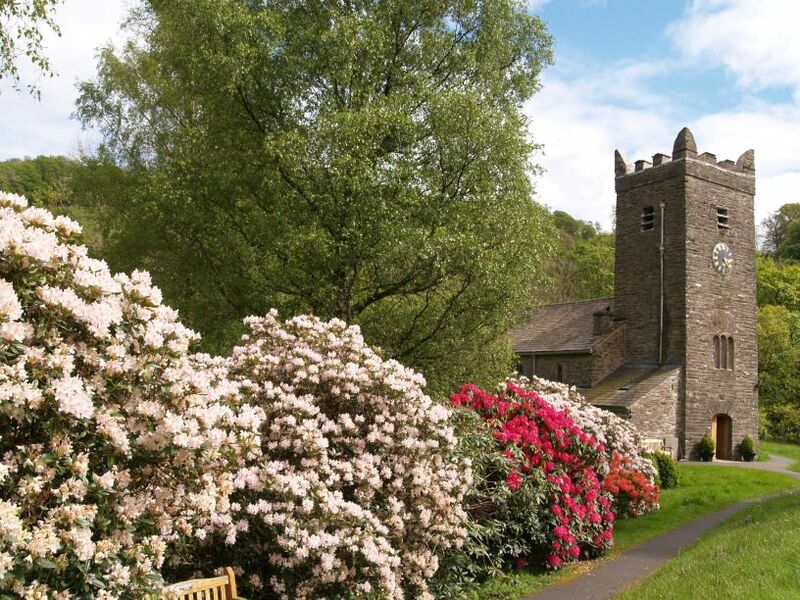 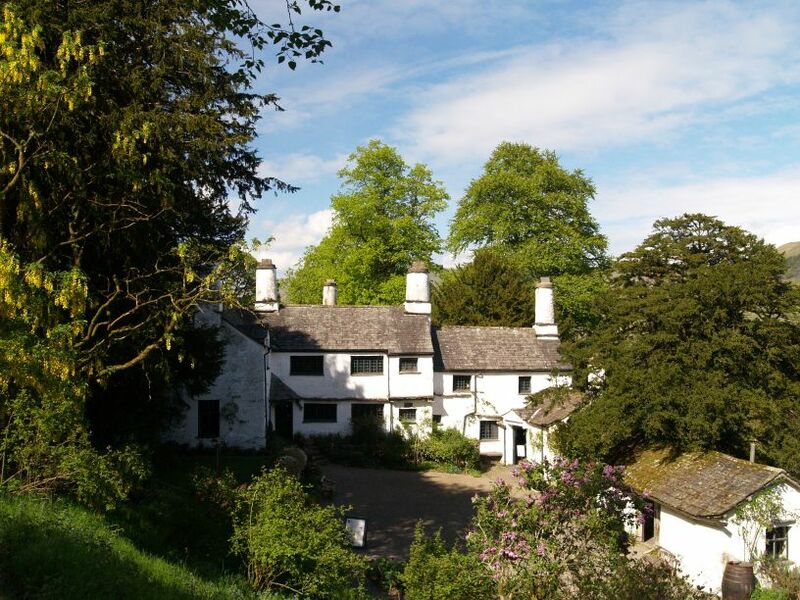 The yard of Town End, Troutbeck. 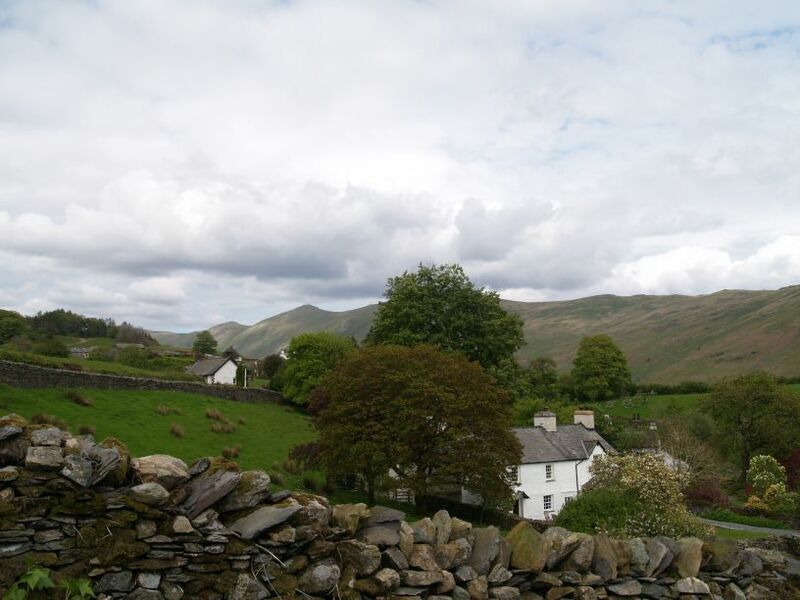 Across from Town End are some old barns.